still I am enjoying the cozy look. to get at a thrift shop last year. Our tree in the library last year. so it can't go up for week or so yet. Definitely warm and cozy looking...and very inviting. When you get your tree up it will be the "icing on the cake". Looks fabulous! All the halls are decked here! I always enjoy seeing your lovely home and leave feeling inspired and refreshed. All looks wonderful! You have such a beautiful home, Carolyn! Your Library does indeed look warm and cozy. Here in N FL we had highs in the upper 80's today but we are having evenings around 58*. That feels near perfect but at Christmas I would love to be having those warm and cozy fires in the fireplace. Your warm and cozy Library looks so very charming. I have all the collections out and am decorated for Christmas with the exception of our tree. We plan to decorate it over the coming weekend, it will be delivered on Wed. and we expect cooler temps by the weekend but we won't have snow, I wish. I can enjoy your beautiful snowy bliss through cyber space and I thank you for that. 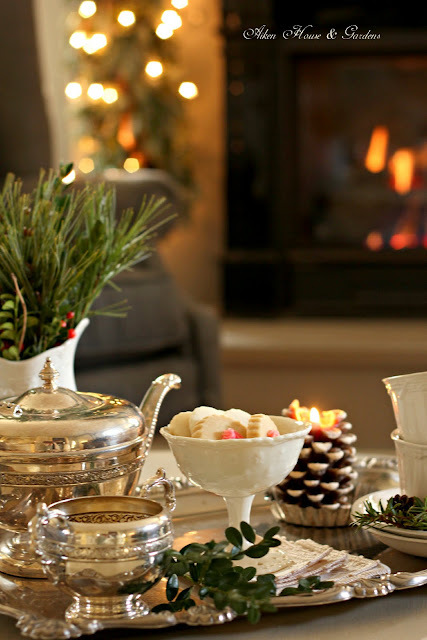 You have the perfect home for christmas, everything is so lovely. Adoro as cores do inverno em sua casa. Sua decoração a deixa ainda mais deslumbrante e acolhedora. Espero que tenha uma boa semana. 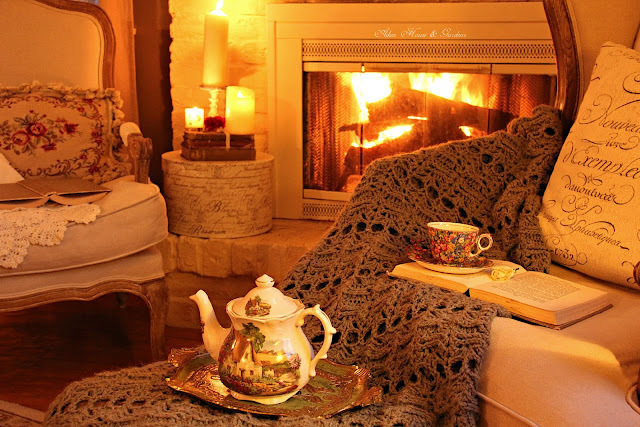 Just beautiful and cozy! I pinned a couple of the tea photos. All so lovely, Carolyn! Your library is warm and cozy and I love the pretty curtains and table cloth. The reds in the boathouse are pretty too. I'm very slow getting my decorating done this year. The tree is up and the lights are on it but I have to decorate it yet. Wish I had some little elves to help me! Enjoy your week. Yes, I have started, but won't finish until the tree is up in the next week. It is such a festive time of year. Your library looks so cozy with the fire burning Carolyn. I just finished decorating the tree tonight after fighting with lights. :) Do you think we'll get that snow on Thursday/Friday? Enjoy. 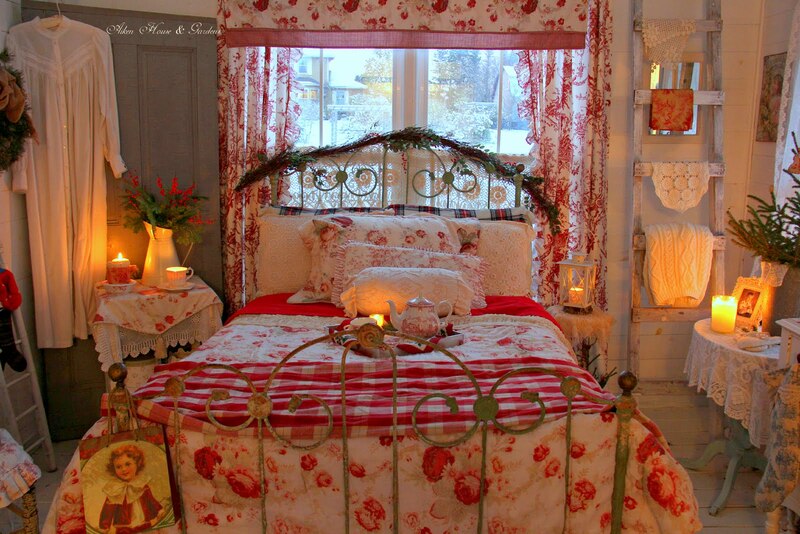 I love how you transform your rooms with every changing season and holidays. It is always wonderful to visit. 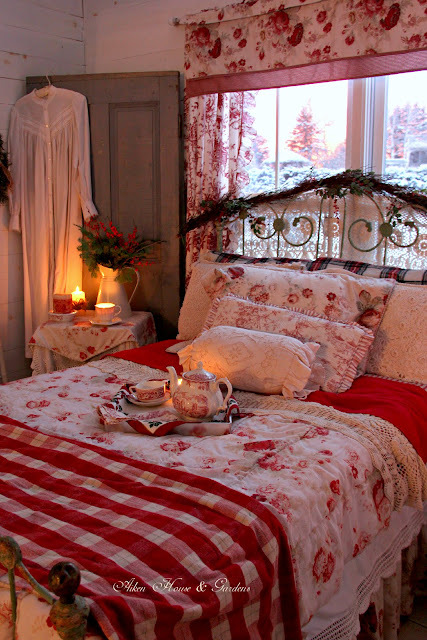 Everything looks so cozy and inviting! Enjoy your holidays! It is March, and Christmas is long over, but these photos made my heart smile today...Is it wrong to say I wish it was Christmas now? Spring is just around the corner, but there's something about the winter holidays that's so comforting and wonderful that no other season of the year offers. What kind of tea do you usually serve when it's cold outside?